Kraft Asian Sesame dressing adds a delicious nutty, slightly sweet flavour to this recipe. Combine tomatoes, water, coconut, fresh coriander, dressing and ground seasonings. Reserve. Heat 1 Tbsp. oil in large skillet on medium-high heat. Add onions and 1/2 tsp. mustard seed; cook and stir 2 to 3 min. or until onions are crisp-tender. Add spinach; cook and stir 5 min. or just until wilted. Transfer to platter; cover to keep warm. Add remaining oil to skillet; heat on medium-high heat. Add remaining mustard seed, curry leaves and chilies; cook and stir 30 sec. Add paneer; cook and stir 3 min. or until lightly browned. Add tomato mixture; cook on medium heat 10 min. or until thickened, stirring frequently. Pour over spinach. Add 1/2 cup frozen peas or chopped sweet red peppers to the hot oil with the onions and mustard seed. For a more traditional presentation, blend the cooked spinach with 1/4 cup water in blender until smooth. 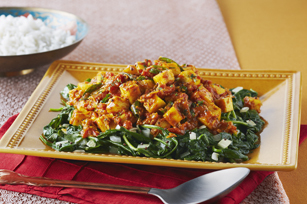 Mix it with the paneer curry before serving. Serve with Frontier Chicken Kababs.